Welcome to the gliders facility. 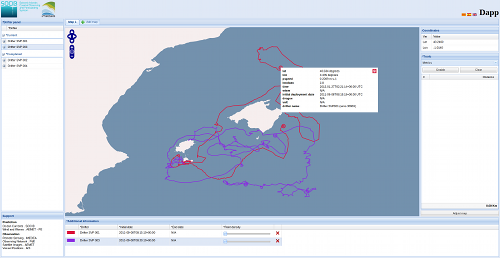 Here you can browse the deployments of our gliders both current and archival. Additionally, performance charts and post mission reports of all SOCIB campaigns can be found in the Glider Report Section. Read more about the gliders Note that in the map, you are able to get several information about the gliders in mission, such as performed trajectory and latest information transmitted by the glider (by clicking the icon over the map). In the table below the map, current and archival deployments are shown, providing several ways of data displaying and downloading. You can browse the archived ones by using dapp o aquesta taula. Aquesta aplicació encara se està desenvolupant. Aquestes dades no s'haurien de utilitzar per propòsits nàutics. S'ha publicat per un ús limitat, amb la deguda precaució. Per les dades en temps real, els controls de qualitat aplicats son limitats.